In the Asahi Journal, Vol.3 No.1, Robert C Mikesh reported a measured value of the surviving external paint as 2.2 GY 2.9/0.5. This was found on top of the nose "under an outer coating of similar green". Mr Mikesh compared this colour to the closest standard Munsell value of 5 GY 3/1 and Thorpe's Dark Green N2. The closest FS 595b value to the measured colour is 34031 @ 1.79, whilst the closest FS value to the standard Munsell is 34052 @ 1.50. These colours seem darker and greyer than N2, which is 10 G 3/2. Whilst it is possible that the green chroma of the paint has degraded over time I consider that the original paint colour may have been more a very dark black green similar to Thorpe's N1. The very blue appearance of N2 is difficult to reconcile with current green and the 'D' series greens in the Kariki 117 document which appear to be based on pure Chromium Oxide pigments rather than the hydrated Chromium Oxide of Viridian. 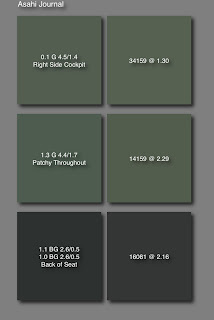 In the same report regarding the interior colours a measured value of 0.1 G 4.5/1.4 was found on the right side cockpit wall and a "patchy" application of a paint measured as 1.3 G 4.4/1.7 found elsewhere. 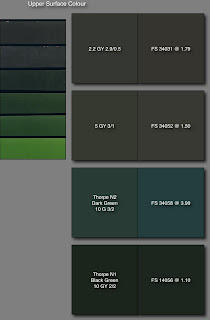 The closest FS 595b values to these colours are 34159 @ 1.30 and 14159 @ 2.29 respectively. They may be described as a grey green similar to the RAF interior green colour. The back of the seat was measured in two readings as 1.1 BG 2.6/0.5 and 1.0 BG 2.6/0.5. The closest FS 595b values to both colours is 16081 @ 2.16. Mr Mikesh re-visited these values in his Japanese Aircraft Interiors book of 2000. He noted a thin and deteriorated wash of green paint (not 'aotake') which the underlying aluminium caused to appear more blue than when making comparisons with colour paint samples. Mr Mikesh likened the colour to the N33 identified in the book, which is 2.5 GY 4/2. A colorimeter reading of 9.3 Y 5.9/5.6 was obtained from just below the throttle quadrant area, which was compared to the closest standard Munsell value of 10 Y 6/6. This seems very yellow when compared to his description but he comments that it is too light. What he considered to be a more representative reading of 9.3 GY 3.8/1.4 was taken from the armour plate behind the seat. Mr Mikesh considered this to be the same colour as is on the seat and general interior. He reported the closest Munsell standard value as 10 GY 4/2 which has a difference calculation of 3.65 to the fractional notation, whereas the closest value is in fact 10 GY 4/1 @ 2.71. FS 34082 and N33 were cited as "close". 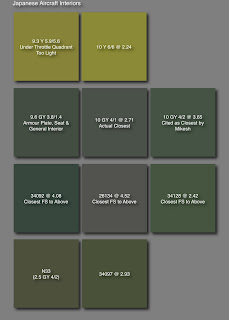 FS 34082 is actually quite a distance from the measured value at 6.63 and is a more yellowish, olive green than the grey green measured. The closest FS value is actually 34092 @ 4.08. The closest FS value to 10 GY 4/1 is 26134 @ 4.52 but it is not a good match, moving into the grey colour space. The closest FS value to 10 GY 4/2 is 34128 @ 2.42. Mr Mikesh commented that a blend between N33 and Pantone 5615C is perhaps the best representation of the colour of the seat. The closest FS 595b value to Pantone 5615C is 24172 @ 2.51. The various colour values cited in this summary are rendered in the chips above. Note in the photograph the multi-coloured panels on Shinden. The nose section appears to be painted in a light colour rather than being natural metal but it does not appear to be the same colour as the wing ID strips. The same light colour appears to be on upper surface/leading edge of the canard aerofoil and note also the light coloured windscreen. Thanks very much for this posting. Maybe of interest is the fact that the Shinden was resprayed after its test flight mishap. It was presented to the Americans in brand new paint. This may explain the different shades of green found on the surviving specimen? To many color chips for just few colors on plane- one topside, one underside... is it final time to somebody relase industrial chart for the japan military airplanes [like the same fro Germans, USA, UK, Italia...]. Nice attempt to explain all of this but after all of this decades I hope that final answer could be given. The colors as cited by Mr. Mikish for the J7W1 are surely the best possible, given the circumstances he had to work with. About seven years ago I purchased 30 color prints from Tim Hortman of the NASM hulk that once was the J7M1. The J7W1 was then very, very disassembled. Its interior and exterior paint work can best be described as in a ruined state at that time. I do not know its current status. I sent a scan of one of Tim Hortman's color prints to Nick, after he made this J7W1 posting. Perhaps Nick will add that image to this posting.